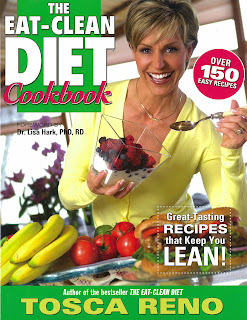 A while back I purchased Tosa Reno's Eat-Clean Diet Cookbook. It has a ton of healthy recipes in it and what I discovered recently is that it also has some gluten-free, vegan, and vegetarian recipes that are clearly marked. I haven't actually attempted to make any of these recipes, nor any of the recipes out of the other 5 or 10 cookbooks I own, but I would really like to one of these days! I'm lucky to have a health food store locally that stocks a ton of gluten-free products but unfortunately that lets me fall into the trap of eating a lot of packaged foods that are high in sugar and sodium. I'm a busy girl! I need to have things that are convenient! So my cookbooks collect dust and I come up with excuse after excuse to avoid cooking. I've also been avoiding working out a lot lately too. I had gotten down to just going to kickboxing on wednesdays and saturdays and now it's surprising if I show up even one day a week. What happened to me? I keep hoping that the gluten-free diet will wake me up out of this hazy life and I'll find my way back to my old vibrant self. Please tell me this is going to happen! Or am I really just this lazy? I seriously hope not. 26 hours left until my follow up with The Doc! I can't wait. Get out of work at 3, head over to Beth Israel, hope for some good news and then go home and take a nice long weekend off. I'll update here as soon as I get back to a computer tomorrow night! I've loved all the recipes I've tried so far from her book! I was afraid there would be a lot of freaky ingredients but there have only been a couple things so far that I didn't have already. I really like the turkey meatballs and White Chicken Chili (big thumbs up from hubby on this one too).